We asked a number of community members to answer a few questions on what community means to them, why The Rapidian matters and how it has impacted their organization and lives. This civic investor profile is a part of a series of stories introducing civic investors to the community. Each story features someone whose contributions have helped The Rapidian. Donate to the Spring Fund Drive, April 10-16, here. Community, to me, means sharing not only the space we live, but also common goals toward growth, sustainability, and prosperity. A community is for everyone by everyone. We participate together to build it. The Rapidian matters because it is a forum for community conversation. It's a way to talk about what matters, what needs attention, and what's happening. It gives ordinary people a voice to share what's important to them. [The Rapidian has affected lives] by raising awareness about issues and happenings in the community. And by empowering the community to participate. Community means listening to the people who tend to be most marginalized by a corporate economy and systemic bias. The Rapidian gives me a place to feature and amplify the voices of those who are often not heard or respected, though they do amazing work. The platform has allowed me and others to start some hard conversations about who we actually value in our community -- who this city is meant for and who is being pushed out. Community begins when we begin to realize that we have interests together as a neighborhood or city that are different and just as important as individual needs. We begin to open our eyes and hearts to our neighbors and see each other as being a part of our community rather than just competitors or people to get around to get what we want that day. As we open our hearts and minds we are changed and begin to see and treat each other differently. It reduces our stress and we begin to see experience the beauty of our neighbors, but also their pain. The Rapidian represents a return to our roots in a certain way. After corporate print journalism hit a wall, it is as if we have gone back to pioneer days, when we have to learn how to do journalism from the ground up again instead of relying entirely on experts. Maybe we're a little wobbly at times, but there is an excitement when people find that they have a voice and others are hungry to hear it. I work with Clinica Santa Maria, which works largely with low income Hispanics. The Rapidian has engaged Hispanic immigrants during the recent immigration crisis and I hope this will begin a stronger connection with the Hispanic community. To me, community isn’t geography. I work in one place (Grand Rapids) and live in another (Muskegon) so my community has always been more fluid and focused on people and groups instead of place. The Rapidian to me is about learning and having a voice. It has always been a place for engaged citizens to express their views and share information that make the community a better place for all of us. All reporters who take the time to be part of The Rapidian are interested in learning. Grand Rapids Community Foundation will always be proud of the start-up matching grant it awarded to the Grand Rapids Community Media center for The Rapidian. We still value the work it does and the voice it gives members of the community. "Community" is a broad macro-level term. Although it can be used as a cliche tagline or buzzword, it's the personal interpretation of the word that gives it power. Community means more than neighbors, sidewalks, and bricks of where you live. "Community" has a connotation of action and personality. "Community" means a group of people that share life together and pursue peace and the betterment for all. In a media world of niche publications and boisterous 24/7 mega-marketing networks, it can be challenging to understand what is happening on the ground locally. The Rapidian provides a platform for Grand Rapidians to share their stories and openly discuss the issues that impact everyone living here. The Rapidian is an incredible resource for nonprofits to share their stories without having to use valuable resources for paid marketing. For Habitat for Humanity of Kent County, the Rapidian serves as a place to tell the story of the need for affordable homeownership. We have control over the messaging to accurately share and bring awareness to our mission. This ensures greater financial and volunteer support from the Grand Rapids community. This impacts future homeowners and the greater neighborhoods they live in. 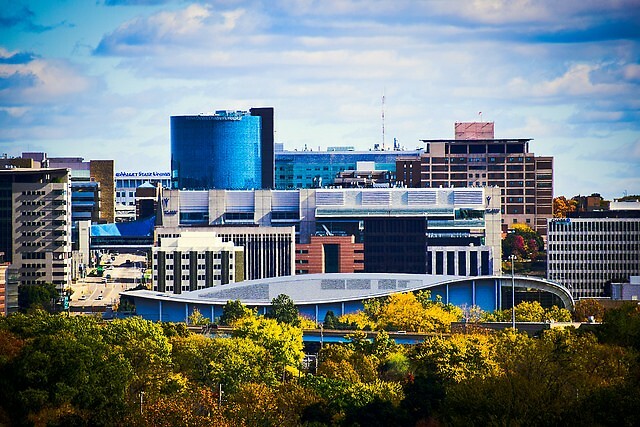 I have been living and working in Grand Rapids for about ten years and have been involved in the arts and culture community since moving here. I came to GR looking for opportunities in the arts, hoping to be a part of a thriving and diverse creative scene. Over the past ten years I have found myself working to build the kind of community I was hoping to find, and now direct programs at the Cook Arts Center on the Southwest side of town, working with youth and families. While I have been here in Grand Rapids, I have seen the creation and growth of The Rapidian as a new media platform as well - not only a place to find news and current events within our city, but a place for the perspectives and experiences of my students, friends and colleagues to be shared. Being able to create our own media and share our own stories, and to read the stories created by diverse groups of people around us, could not be more important. From local town meetings with police to a student who wants changes to our public transportation system - we get a fuller picture of our city because The Rapidian exists.